David Gittens, inventor of the award-winning Ikenga gyroplane, does not confine his creativity to aircraft. His professional work encompasses fashion photography, furniture design, and environmental playgrounds. Even his approach to the Innovative Lives program was inventive. 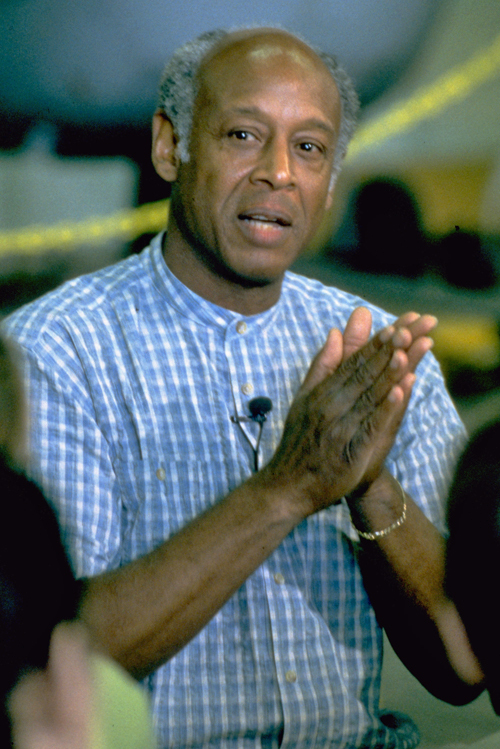 Before his May 7, 1997 presentation at the Smithsonian's storage facility in Maryland, which houses his gyroplane and other aircraft, Gittens asked sixth-graders at the Walker Grant Middle School in Fredericksburg, VA, to send him drawings of their own ideas for new inventions. By the time the group assembled that morning, Gittens had reviewed and written comments on each one. As the students sat in a circle with their drawings, Gittens talked with them about the long process of turning his childhood dreams of flying into a working aircraft. David Gittens, 1997. © Smithsonian. Photo by Jeff Tinsley. When Gittens was a boy, he daydreamed about flying like his space hero, Buck Rogers. He never lost his fascination with flight and speed, and as an adult began designing and building high-speed cars. Then, in 1967, a British company asked him to design a better gyroplane--an aircraft similar to the helicopter, but with a rotor powered by wind rather than by a motor. It was a challenge he welcomed. Gyroplanes had been built since the 1920s, but Gittens had ideas that revolutionized their design and capabilities. He wanted to build a gyroplane that would be especially useful in developing countries--inexpensive, easily maneuverable, and multi-purpose. To keep costs low, he would not manufacture special parts, but would look for the most efficient existing components. It took only nine months from his final drawing to the first flight. He named his craft "Ikenga" in tribute to his African heritage. The word is from the Ibo culture of Nigeria and refers to the creative life force of humanity. After talking with Gittens, the students had a chance to inspect the Ikenga 530Z—and even sit in the pilot's seat--as well as other historic aircraft. He reminded the sixth-graders that the innovative process can be applied to any area of activity--not just science, but the humanities as well. David Gittens told them that he believes any idea can be realized. Intuition, perception, intentionality, and persistence are the keys.